After reading today’s scripture (Proverbs 1-3 and Romans 7), I looked out our window into the backyard while meditating on what I had read. And thats when I saw it – creeping charlie! With all the rain we have had, it is growing and thriving. The small lavender flowers are beautiful yet deceiving. 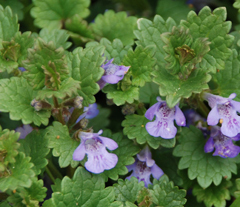 It was introduced to this region as a ground cover and it is quite effective as that. Once it has taken hold, it spreads, and if I ignore it, it will easily take over the backyard, overwhelming the grass – and we have invested a lot in that grass. Like looking out into the backyard this morning, grateful for all the raining and how lush and green the yard looks – only to realize I’ve ignored the creeping charlie and it has taken hold. I don’t need to describe what that looks like in my life or yours. We know. When sin takes hold. “Now if I do what I do not want to do, it is no longer I who do it, but it is sin living in me that does it…. What a wretched man I am!” The lavender flowers are so pretty and all I wanted was a lush, green lawn! Who will rescue me?”Thanks be to God who delivers me through Jesus Christ our Lord!” I now know what needs to be done, and through Christ, I am set free to do it. Proverbs calls it Wisdom – God’s gift, God’s presence. Like a tree of life to those who take hold. I can suddenly look at my life and realize that is by the grace of God through Jesus Christ that I am saved. Then take hold of Wisdom and let the grace of God grow. So, this morning, I am wondering what is growing in my life and what has taken hold of me.